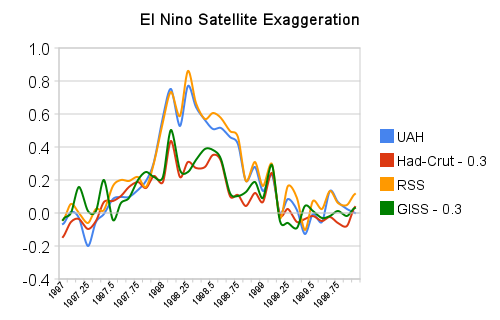 Satellite Temperatures and El Niño | Watts Up With That? UAH and RSS satellite data have been showing record warm temperatures in 2010, despite the fact that many of us have been freezing – and CAGW types have been quick to jump on this fact. But Had-Crut surface data has 2010 at only #5 through March, which is the latest available. So Watts Up With That? I don’t have any theories about root cause, but there are some very interesting empirical relationships correlating ENSO with satellite and surface temperatures. Satellite TLT data is measured at 14,000 feet and seems to get exaggerated relative to surface temperatures during El Niño events. Note the particularly large exaggerations during the 1998 and 2010 Niños below. UAH (satellite) is in red and Had-Crut (surface) is in green. Looking closer at the 1998 El Niño, it can be seen that both UAH and RSS 14,000 ft. temperatures were highly exaggerated vs. normalised Had-Crut and GISS surface temperatures. The chart below shows the same data as the one above, but also plots ENSO. This one is very interesting in that it shows that the satellite data lags ENSO by several months. In 1998, ENSO was nearly neutral by the time UAH reached it’s peak, and the 1999 La Niña was at full strength before UAH recovered to normal. May 14, 2010 in ENSO, Sea Surface Temperature, Uncategorized. Something has happened to the UAH data. I recall during the Y2K leadup that there was some debate on a Y2K website (now gone of course) about the threat of global warming and the fact that 1998 was a record year. 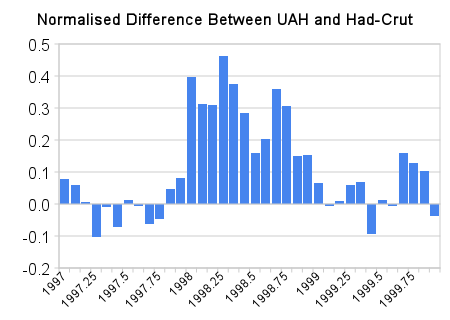 At the time (late 1999) the UAH data showed a smaller anomaly than HAD-CRUT. Somehow that has changed in the last 11 years. Has the HAD-CRUT data been altered to make 1998 cooler (not likely) or has the UAH data been adusted upwards? Hide the decline until the Cap & Trade bill is signed! Steve, I’ve asked some pretty basic questions about the satellite temp readings. From the people I find credible, here’s WUWT. First, the satellites don’t measure surface temps. Secondly, they’re not calibrated to any thermometer. I don’t give much credence to the “reported” surface temps, but comparing it to some altitude reading that isn’t measured by pressure on mercury strikes me as odd. I don’t have the technical expertise to explain what the difference is, only I know it is a significant difference. I can look at the map of anomalies an know it doesn’t reflect reality to the surface temp I experienced in April or now. In April, in SE Kansas, we probably had 2 days in which the temp was acceptable (for me) to go fishing. All other days were too wet or too cold. That in itself is an anomaly. Perhaps we’re witnessing a dynamic that hasn’t been considered. Perhaps it is simply warmer in an altitude above us that isn’t relative to surface temps. I don’t know, what I do know is, in the part of the world I live in, the map doesn’t reflect reality. I’m worried that we will be offered up as evidence a new kind of model in the form of a liquid globe to try and maybe replicate and predict Ocean dynamics!!!! It might soon be used in relation to ‘climate change’. So… surface temperatures are still declining? Even when considering that most sensors suffer from UHI? It’s worst than we thought! Regardless, I trust the satellite data more than the ground data as there are far fewer fudge factors and sources of error. Doesnt this just show that the hot air from the ocean rise up, and the heat is radiated out to the cold, empty space? As expected? UHI effects would drive the UAH minus HadCrut numbers in the opposite direction. On thing for sure – if it were GISS and Had-Crut showing the positive anomalies, skeptics would be criticizing them. It is important to be balanced and keep our eyes open. I live in south Alabama. My wife has always had the giant elephant leaf plants and a few ginger plants. This year none of them ever came up. I guess because of the many days in a row of below freezing temps we had over the winter. Like you, I can’t exactly explain this but something is going on. The maps do seem strange. OK, if the plots are correct, then the El Nino Ts are reported higher by the satellite datasets, and lower by the climategate-hadcrut dataset. (4) The climategate-hadcrut 3 T-dataset is acceptable – or it is accepted whenever handy. Don’t worry everyone, soon the UAH anomalies will fall then we can go back to rubbishing the GISS and Hadley. When I run the regressions on the different temperature series over the entire time periods available, I get more-or-less the same response to the ENSO. By itself, the coefficient for the Nino 3.4 lagged 3 months on RSS, UAH and Hadcrut3 is 0.082 and 0.065 for GISS. When the AMO is also a variable, the coefficients are 0.078 for Hadcrut3, 0.061 for RSS, 0.066 for UAH and 0.060 for GISS. So, this means that N. Hemisphere summer will ramp up as UAH plunges, eating into it. S. Hemisphere winter will ramp up as UAH plunges, driving it to an icy frenzy. N. Hemisphere Winter will come in like a bear. On the AMSU channel 4-8 channels and their apparent divergence from the channel 9-15 and the surface reading (actually 15 from memory). Go lookup the actual User Manual and the Calibration Manual for the AMSU instruments. They are in PDF form and I am not going to do the digging for you. They are public, or were, and if I remember they are on a NASA site. I’m not saying something is malfunctioning or mis-calibrated, only the possiblity. As you read these documents notice that there are not this myriad of channels, only two actual instruments and channels. The channel 4-8 and 10-14 (once again, as I remember) are manufactured by algorithmic combinations of the soundings from those two. I am just saying pay attention to exactly what you are looking at as data. Certain data is not equally made to other data which is real and even the real data still has uncertainty and is created by real flawable instruments. But I am sure these are well built and seldom have problems, if ever. It is curious however why half of the channels show high and half do not. I have noticed this since January. Indeed, that’s a bold, falsifiable prediction. Yes, it’s pretty clear that the Had Crut people suppressed the temperatures back in 1998 just so that they could hide the relative decline in subsequent years, whereas the UAH 1998 spike showed that temperatures declined steadily for years afterwards. Well, until this year, after which we’ll be able to see the temperatures decline again on the UAH trend but not on Had Crut, where they are already fiddling today’s temperatures downwards in anticipation of hiding future declines. Basically, fluctuations in temperatures at the surface are amplified in the troposphere. This is not the case with trends, IMAO because the surface data contains spurious warming. There is no fudge factor greater than failure to calibrate your instruments. Seems to me that UAH vs hadcrut shows that 14,000 feet has more varaibility than surface through the whole record, just easier to see in el nino years because it is a bigger spike. Since it is colder at 14,000 feet than at surface, would we not expect higher sensitivity to an energy fluctuation and hence a bigger anomaly? Somebody Normalized the Had-Cru but NOT the UAH. — the Satellite records show a NARROWER Peak/ and /WIDER Dip ( ! ? ) , for All big jumps, than Had-Cru. For Magnitudes of the peak of the Peak, & low point of the Dips, the 2 are nearly Identical. I’ll bet he’s right again. These satellite measurements are not calibrated to surface thermometer data in any way, but instead use on-board redundant precision platinum resistance thermometers (PRTs) carried on the satellite radiometers. The PRT’s are individually calibrated in a laboratory before being installed in the instruments. Think R Spencer will/should reply soon…. December: #1 … highest ever ( 3.2 degrees C. above normal ). Though not unsurprising if you read Shindell, who found that Cap & Trade is Quadrupling — or more, now — the Arctic temperature rise, over the 1976-2008 Global average rise. That is, the effect of Sun on Ice that has added Diesel & Coal Soot, and is no longer diffused by SO2, is STILL magnified. In Contrast the Global temp rise that, for 1977-to-2007 added the “up” half of the Pacific’s 60-year cycle to Man’s Heating — is now SUBTRACTING that cycle from Man’s Heat, since late 2007 (& the shorter Pacific cycle, reversed too, maybe since 2003 — when La Ninas became more numerous, but not Stronger), albeit we’ve had a BIG El Nino forcing temps up the last 6 months or so. Yeh, I look at the map, and I know the temps on the surface in my area are not reflected. The satellites don’t measure surface temps. Apparently, it is assumed a direct correlation between the two. I believe what we’re seeing is the difference. What ever the case, it is the middle of May here. I’m running my space heater. Anyone can state it is the “hottest” year ever, and perhaps it is. Only it isn’t here. By now, I’ve usually got my freezer started with the fish catches and wearing shorts when I’m not at work. I’ve worn shorts for a total of 5 days so far this year. We can put whatever global map anyone wishes to, it simply doesn’t reflect the reality here. We had an extended winter, a very brief warm spell, now it is unseasonably cool here. Exactly right! I mean, you keep hearing the alarmists harping on about about how all the CO2 from the population centres gets quickly dispersed but they keep very quiet about how exactly the heat from those cities mixes into the atmosphere. It’s clear in the global map at the top of this page that the UHI effects created in the US eastern seaboard have spread northwards over northern Canada as some kind of red/yellow cloud of excess heat. “Yet another way to hide the decline” – after Jones has been cleared by two enquiries to date!? Keep saying it long enough and everyone will believe! “It needs to be established that… the urban heat island effect has not contaminated the surface temperatures, as proposed 200 times on this site”. For an excellent and easily digestible treatment of UHI read the GISS web site. GISS show graphs of temperature without UHI correction against three different correction approaches based on night lighting, population and regional weather station data. The effect is real but small and in no way detracts from conclusions regarding global temperature changes. Is it possible the satellite temps don’t correspond to the surface temps on a one-to-one basis? If it isn’t, please explain. Personally, I find it silly to believe one can state if the temps are x at a particular elevation, then one only has to use a x+n formula to get the temps at the surface. I could be wrong, and would like to see the formula for extrapolating how sat reads somehow equate to surface temps, but I really don’t believe they do. I’m curious about the trends moving upwards in elevation. Some people here seem to think that the RSS and UAH data show higher temperatures that at the surface. This is not the case. What they show are anomalies, that is, deviation from the average of a base period, at that same elevation. So rain and snow and hail will form between 10,000 and 60,00 feet. As they form, heats of vaporization and freezing are released to the atmosphere. More rain & snow –> more heat –> more anomaly. What about the fact that 71% of the globe is covered by ocean and Spencer has already suggested that readings over the ocean would not be as cold ( during a cold NH winter) as the more land based readings during this El nino event? Perhaps Goldman Sachs hacked into the Satellite and is adjusting the data higher so that they can make their money on carbon trading and then betting that our economy will collapse? Atmospheric temperature is NOT a measure of heat energy content. The atmospheric energy content is hugely affected by humidity. Humid air can hold close to 80 times the energy of dry air (look up enthalpy). Therefore it is possible to have a higher temperature but lower heat content. It is the heat content that melts ice (provision of latent heat) not the absolute temperature. It is therefore quite possible to have atmospheric temperatures go up while atmospheric heat content goes down. Atmospheric temperature is the WRONG METRIC for atmospheric heat content. So it is perfectly possible for major cold problems to occur in Mongolia and the entire northern hemisphere – while ‘average global _temperatures_’ are high. Atmospheric temperature is a meaningless metric as it bears no relation to atmospheric heat content. Curently there is a large moisture accumulation (= heavy precipitation and consequent release of latent heat into the troposphere) around Indonesia, a knock-on effect of the recent El Nino. That activity will subside soon and the troposphere will noticeably cool. El Nino causes additional tropical thunderstorms and those extra storms inject their warmth into the troposphere. I believe that’s why the tropospheric temperature shows such a strong response to El Nino. Does anyone want to speculate on how the waning El Nino and current trends might affect the drought in South America? If the rainy season is late or light in Venezuela it could have some profoundly negative implications for the people of Venezuelian people due to state mismanagement of the Guri Dam and the energy system in general, agravated by the El Nino induced drought. The generators are already at risk from the low water level and the rainy season needs to be heavy to keep the problem from occuring in the next dry season. Will the rainy season be back to normal or will it be a weak one and possibly cause a catastrophy by next year? I am not sure how to interpret the above “UAH minus Had-Crut vs. ENSO” graph. Here, it looks as if ENSO was already negative in June 1998. However, according to this http://www.esrl.noaa.gov/psd/people/klaus.wolter/MEI/#LaNina>NOAA graph, June/July 1998 was still slightly positive. But it looks like ENSO in 2010 for the months May-August to come will be lower than in 1998. For a moment, before April data came out, I thought the same. But wouldn’t we need El Nino conditions until the end of the year for 2010 to beat 1998? , thus higher (albeit not significantly) than April 0.501. That’s why it seems to me that we should not worry anymore about any bets for 2010 to become the warmest year. It’s very unlikely, just wishful thinking of CAGWarmists. Over 180 equations, over 17 variables necessary to process to make a temperature reading from a sensor on a satellite! I believe the word people are looking for in this abnormality is pressure build-up. Extra pressure build-up does not come back to the planet surface due to centrifugal force and an elastic atmosphere. This is another observation that supports my view that the energy flux from atmosphere to space is set from above (most likely by the level of solar activity – hence a cooling stratosphere when the sun is active and a warming stratosphere when it is less active) and the energy flux from below is set by sea surface temperatures. Thus during an El Nino the upward flux from the oceans ‘backs up’ in it’s progress up through the atmosphere if it is not matched by the energy flux to space set by the level of solar activity. Look for evidence of temperature inversions in the upper troposphere of the supercells. The quiescent Sun, cooling oceans since 1998, and consequent decreases in tropical storm activity suggests decreased upper air mixing, stratification of the troposphere, and development of colder lower tropospheric conditions and warmer than usual upper tropospheric conditions due to the decreased circulation within the supercells and between the supercells. I always felt this animation provides some insight into why certain regions are affected the way they are by an El Nino or La Nina and why the climate, climate regions and even ocean currents are the way they are. And it is the extent of that ‘backing up’ during an El Nino episode that influences the strength of the polar high pressure cells to give a more negative polar oscillation. The difference with 1998 being that then the sun was more active so less ‘backing up’ occurred and the effect of that El Nino on the polar high pressure cells was far less than we are seeing now during a spell of quiet sun. The latitudinal positioning of ALL the air circulation systems is thus dependent on the interplay between sun and oceans with a consequent effect on global albedo which feeds back into the system via the oceans over longer time scales as per my New Climate Model. Normalisation is a shift, not a scaling. The X and Y scales are identical on all four temperature sources, and the “higher peak” is real. You might want to test the data for yourself before making such incorrect claims. Except at sea, unless ships are spreading the UHI effect after leaving harbors. Probably not at Glacier National Park and a few other places too. Basically, fluctuations in temperatures at the surface are amplified in the troposphere. Yes…The basic picture in the tropics (where the air is moist and convection is the dominant mechanism) is this: Imagine two parcels of air at the surface, both saturated and one at a temperature of 1 C warmer than the other. As they rise up in the troposphere, they expand and cool (adiabatic expansion); however, being saturated, they also have to condense out some of their water vapor and this releases latent heat, reducing the amount of cooling from what would otherwise occur. The warmer parcel has to condense out more water vapor for each degree that it cools than the cooler parcel (because, as a function of temperature, both the saturation vapor pressure and its derivative increase with increasing temperature). Hence, the warmer parcel will release more latent heat and will thus cool more slowly than the cooler parcel. As a result of this mechanism, a certain temperature difference at the surface tends to get magnified as you go up in the tropical troposphere. This goes by the name “moist adiabatic lapse rate theory”. As timetochooseagain alludes to, this picture is the explanation of why the climate models predict the so-called “hot spot” in the tropical troposphere, i.e., they predict that the temperature trend should be magnified as you go up in the tropical troposphere. (This prediction is sometimes falsely claimed to be a prediction specific to the mechanism of warming due to greenhouse gases, but it is not. The temperature structure in the troposphere, at least in the tropics, is dominated by the atmospheric dynamics.) 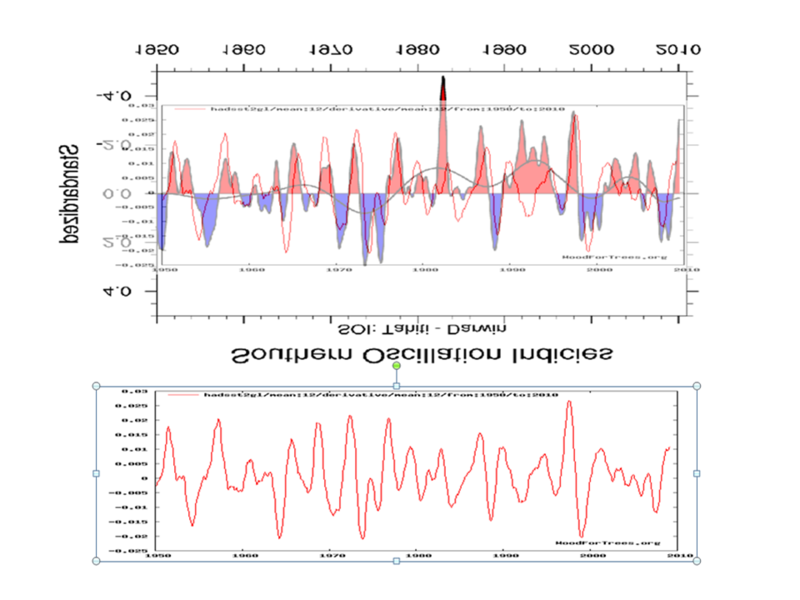 The data clearly show this magnification for fluctuations in temperature, such as those due to ENSO, as Steve Goddard has (re-)discovered in this post. The data for the multidecadal trends are more ambiguous because all the data sets used have issues in regards to artifacts that could affect the multidecadal trends. The general temperature behavior appears to have a period of 60 years – the multidecadal period – a sine curve with period 60 years and amplitude 0.25C on top of a 1C/century increase. 1910-1950 is similar to 1970-2010.
shows a similar pattern in the 1940: TWO peaks before a big decline. I have asked before the same question as Jantar above. Probably around 1998-2000 HadCrut must have shown the 1998 peak AT LEAST AS BIG as shown by satellites, to prove warming. The same 1998 peak is now SMALLER than the satellites, so as to diminish the cooling 1998-2010. QUEST: Does anyone have a record of HadCrut temperatures as put out around 2000 (web or publications,) so we can check it against HadCrut temperatures now? If we had discovered that Earth’s average temperature can be regulated by simply adjusting the trace amount of CO2 in the atmosphere, it would be one of mankind’s greatest accomplishments. But the facts do not support this hypothesis and our understanding of Earth’s climate system is much too rudimentary to be assigning primary driver status to anything……..
Of course the facts support the hypothesis. That’s why you won’t find a scientific society of standing that disputes it. So whatever their normalisation algorithm is doing, it isn’t scaling. Which hypothesis? The original null hypothesis? Then I would have to agree. But any putative… *ahem*… “fact” that supposedly supports CAGW is in reality nothing but a conjecture… which is all that CAGW is. Unless you can provide testable, empirical evidence based on reproducible raw data. But of course, that is the big stumbling block for the CAGW contingent. How do I know this? A little birdie told me so. How about some empirical observations? No database exists with enough resolution to determine if CO2 is having an impact. If you look at the historical temperatures, UHI and erroneous/missing algorithms are enough to explain all of the warming that can’t be attributed to the normal 60 year cycle. Doesn’t say much for your appeal to authority who have to rewrite history to invent a non-calamity. The scientific societies have been taken over by activists, more interested in poly sci than sci, sad to say. Could you run through that again, and this time explain how that affects our land & sea temperature? I get a mental picture of a ‘lid’ on the pressure cooker. Do you have a specific null hypothesis in mind? Where I live, winter 2009/10 was the hottest I’ve ever seen. Just across the mountain range, it was frigid. Spatial patterns vary over time – (also simple). It only gets complicated if cravings for sweeping generalizations go unrestrained. Heat goes up and arrives at the troposphere with some latency. As it gets stratified laterally as well, there is an amplification. Increased temperatures increase the loss to outer space and are just another manifestation of the (natural) negative feedback. we’ve had a BIG El Nino forcing temps up the last 6 months or so. No, it’s been a moderate El Nino. 1998 was a big one. Check the numbers. Or you can look at a graph. Sun spot count is lower now than in 1998, too. You had a “hot” winter? First time I have heard of that concept. I hope you are correct about getting a response from Dr. Spencer. I have been asking this question for a long time, and haven’t heard a satisfactory answer from anywhere. 1. Average global temperature has been rising. 2. CO2 from man’s activities has been rising. 3. CO2 is a green house gas. 4. Green house gases have a global warming effect. So more CO2 in the atmosphere from man’s activities(e.g., burning fossil fuels), causes more green house gas, which in turn is a warming influence. Natural influences(changes in solar activity and ocean currents) can add to or subtract from the man-made warming. Recorded global temperature data do not support the notion of a “normal 60 year cycle.” In a cycle, temperatures would increase and decrease, but return to a mean. In contrast, recorded temperatures show a long-term rise. Latest data at UAH brings the temperature trend for that set to 0.14C from 1979 – present. That’s within 0.02C of the trends derived from the other data sets for the same time period (RSS/GISS/CRU). Seems they’re getting closer to each other as time goes by and the law of large numbers reduces discrepancies – and makes the quibbling over slight differences a bit overwrought. Meant to say: 0.14C per decade. So I think I get it. Warming causes increased convection so warm air goes up, mostly in the warmest zones and pulls cold air in behind it mostly from the colder zones. So warm air goes up at the equator and spills over sideways somewhere around 14000 feet or so, so they can lie on their backs waving at the satellites and screaming hey look at us! In the meantime air from the arctic zones has to come in underneath to replace the warm convecting air, and so cools off the land surface as it goes. Ergo the earth is warming up and the nasty cold summers for the last couple of years are evidence. So how hot does the planet have to get before it starts snowing in Florida in July? Yes they do Wren. They show a long term rise that started a couple three hundred years ago and haven’t changed their slope hardly at all despite a 38% increase in CO2 that only showed up part way through the last century. Or does the CO2 in 1980 cause warming in 1780 as well? The 60 year cycle is clearly visible in the temperature record, superimposed on a much longer cycle that has been in an upward trend for centuries and which shows no evidence of being accelerated by CO2. I think it sad that you keep regurgitating this stuff even tough its been explained in multiple threads multiple times to you and you just repeat it anyway. Hey I checked your bank account. There’s been some deposits to it of the same size I was expecting in mine that never showed up, so that must be my money, please send it over. I am particularly interested in micro climates and the way they can alter naturally due to changing weather patterns. Can you tell us where you are from and which adjacent area had such a different winter? You are right of course. Temperatures have been gently rising since 1690-obviously with some notable reversals and advances (1700-1730) -but the temperature has drifted upwards. The 60 year cycle (or thereabouts) is clearly visible. It would be reasonably accurate to say that when looking at all the seasons we are getting less cold rather than getting warmer. Less cold winters have a disproportionate effect on overall mean averages as they have a higher variability than summer temperatures. Pssst, HadCRUT (not Had-Crut) leaves the Arctic out of its global average. That’s the place with the highest positive anomalies. Keep ’em coming, Steve. Doing a great job. It seems there is a recently published best selling (110,000 copies sold) book in France called Climate Imposture, written by the former Minister of Science. It has the alarmists in a fury and ranting and raving all over the place – see Real Climate. In France, the ‘climate scientists’ there want the book banned. It seems there have been TV debates on this over the last couple of months which have had the effect of pushing the non-sceptical French into the sceptical camp. Is there any chance of an an analysis or comment on this book from you or one of your contributors? I hope Roy Spencer has some way of telling if his incoming MSU data has … .. changed. That could have been said about any number of hypothesis in the past too. Some have been shown right, some tragically wrong. One hundred and fifty years ago no scientific society of any note seriously disputed that God created man whole. Now, I believe, some do. In any case, I believe that you might be wrong in the original assertion. What is the position on global warming of, say, the Russian Academy of Sciences? The AGW cheer-leaders are a few specialist outfits (Hadley etc), some journals (Nature, New Scientist etc) and some people with no training at all (Gore etc). Most scientific societies issue bland statements and stay out of the fight. They know that the issue is too divisive. Any attempt at entering the fray, either way, will alienate a significant number of their members. They are right – it is too politicised to be safe. The “consensus” hangs and falls on the IPCC when it comes down to it. If the IPCC were to issue a sceptical document, the whole “consensus” would melt in a moment. Compare this to the situation if the UN made up an IPE (International Panel on Evolution) and issued a statement, under pressure from religious fundies, that evolution was incorrect. In that situation there is a real consensus among biologists, and the UN would be ignored. Something I don’t quite understand, if satellites are taking the atmosphere temperatures, then when they scan to the sides, they are going through further atmosphere compared to the straight up and down measurements. Any measurements that are not constant in distance and space can show massive variables depending were the satellite is positioned. 1. The global temperatures respond to El Nino with lag of about 6 months. 2. The troposphere temperature is more sensitive to El Nino than the surface temperature. Both look to be quite reasonable responses to an El Nino. I think both you and PearlandAggie need to get the area size of urban developments relative to the rest of the world into perspective. You could drop the top 20 largest cities in the world into Texas and not notice they were there. The reason that UH *might* have an impact on surface temperature trends is because, for obvious reasons, the stations happen to be close to urban areas. How do you determine which is the dependent variable? If ENSO causes heat, where does it come from? What cooling would that be? 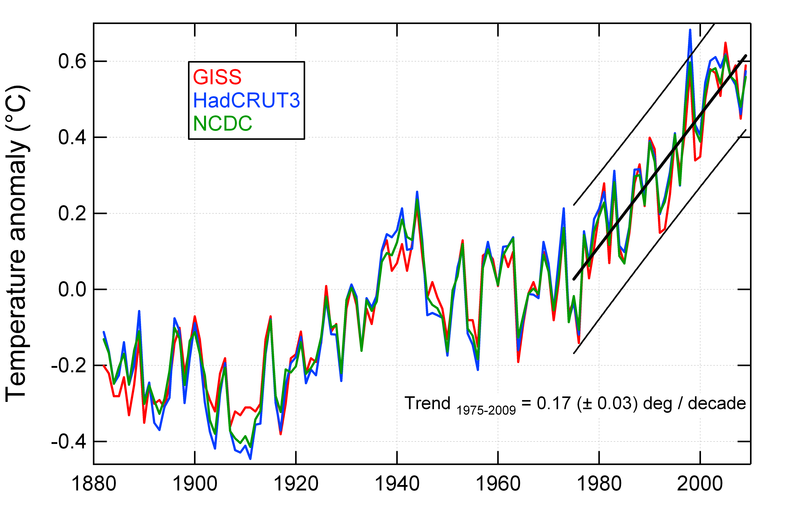 I’ve been using Hadcrut for about 6 years and there’s been very little change in the 1998 anomaly. There was always a bigger spike in the UAH record. Several flaws in your logic. 1. I am not discussing the 31 year satellite trend. I am discussing the 200% anomaly discrepancy during ENSO events. OOPS ! Somebody Normalized the Had-Cru but NOT the UAH. I cannot comprehend why scientists do not abandon the “anomaly” method and use actual temperatures, even if they are degrees C and not K.
The anomaly method is sensitive to the selection of climate stations in the reference period. Stations added or removed after the reference period cause this. The effect can be tailored to suit preconceptions by those who open and close stations or select them for analytical studies. It’s not good science. It is an obvious FACT that what the Satellite data calls Surface Temperature is not. Apart form a small area of the west the Northern Hemisphere has had it’s coldest Ground based Temperatures for many years and has broken many records. The Northern Sea temperatures as measured by Argo Bouys do not show the Seas warmer now than in the past 10 years. Yet dispite all this REAL evidence we still have Satellite Global Surface Temperature Anomalies the highest ever and not only that all the PLUS anomalies are shown in the Northern Hemisphere. It is definitely a case of 2 (Ground) + 2 (Sea) does not equal 4. 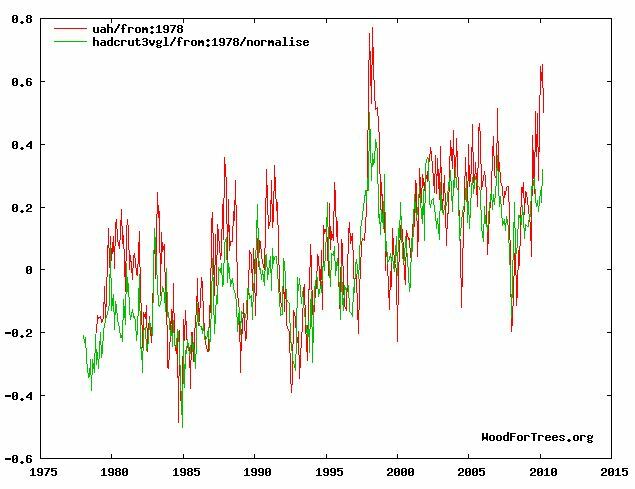 I think an offset of -0.23 applies to the GISS record not Hadley (different base periods). The mean Hadley anomaly for the 1979-98 period is ~0.15 deg. The UAH anomaly is, or should be, approximately zero. I’m assuming (I haven’t read the WFT blurb) an offset of -0.15 for Hadley would provide a reasonable comparison between the two, i.e. The mean GISS anomaly for 1961-90 (Hadley base period) is ~0.08 which should, in theory, mean the GISS offset is -0.23. Unfortunately GISS and Hadley didn’t track each other as closely as they might during 1979-98 so the GISS average anomaly for 1979-98 is a bit higher – I think (can’t be bothered to check). Hide the decline ! Werenot these the words choosen in the east anglia climategate emails ? Apparently the american burocracies are showing a more professional behaviour than the east anglicans where there is some conscience left and truth can be discussed. Please read the american mission statements well and they are validating that these are fully purpose-driven . Is the word truth ever mentioned here ? So it is obvious what is happening under our eyes . The cap and trade crap must be pushed through no matter what , even when the rest of the world is not doing a thing , on the contrary , is trying to benefit from the situation developing in the usa , where pieces of paper all of sudden are becoming highly valuable out of thin air and who is going to pay for them , nobody else than the us taxpayer , who already took up the burden laid upon them by a ruthless elite . So on the short term dramatic temperature readings are needed to fool the innocuous part of our society , may be the mayor share of the population and get them to okay the life work of our highly esteemed leader obama and his godfather al gore , a system to control every citizen in the usa , whilst they are able to live their luxury lives with private or governmental planes , nine bathroom mansions , to live a life with unlimited spending , whilst the bulk of our population returning towards poverty . O sure , they will claim that you wanted this and that these are costs and everybody must make a contribution and o well see how temperatures are falling now that we are controlling the exhaust of combustion gases , not taking into consideration that the output increase in india and china will be many times bigger than the us savings . Al gore and friends know damn well how badly they are cheating the public , but they are also aware of the fact that it will be very hard to continue the fooling of his cocitizens given the circumstances that the sun has nearly fallen asleep and the enso temperature modulations will become very negative i a short wile . This is for them the ideal opportunity to install the system so the most natural events can then be explained as benefits of the system , whilst at a further stalling of the capandtrade implementations their cheating would become too obvious . A telltale sign is a reccent change in the mission statement of NOAA , showing that the us burocracy is slowly but surely wakening up and individuals are claiming their rights and liberties . Being a lawyer , for mr obama truth does not count , although there can be found truth with him in the words he is not speaking ! I’ve just had a very quick look at the ‘normalise’ option. Select the normalise option for both sets of data similar below. Note that the max and min for both datasets is at exactly the same point, i.e. about +0.5 for the max and -0.5 for the min. It seems as though normalisation, in this case, scales the data between a range of 1 (e.g. -0.5,+0.5, -0.2,+0.8…). No idea why but the cup final is on shortly so I’m not going to bother with it now. @James Sexton The brightness temperatures (the raw data) measured by these satellites is the integral of temperature of the surface and the atmosphere times the weighting function of the channel to the first order. To get an estimate of a temperature at a discrete pressure level, you have to go through all sorts of mathematical gymnastics to add and subtract the various brightness temperatures from all the channels. It can be done and done reasonably well. You will not get the exact temperature you would have measured with a radiosonde, but then again the exact temperature measured by a radiosonde has errors too. The fact that the TLT channel peaks up a bit in height means it is most accurate at that level, but it does not mean that lower levels cannot be reliably estimated. Its known as the inversion problem and there have been tons written about it. I did my PhD in it long ago and far away. Ypu can theorize all you want, but the normalisation did not scale the data. It shifted HadCrut by -0.23 with no scaling. My last post was wrong. You were correct. Dr Roy Spencer explains the climate null hypothesis: No one has falsified the theory of natural climate variability. That is the null hypothesis. The climate fluctuates naturally; always has, always will. The current climate is completely ordinary. What is happening on various parts of the globe has happened many times in the pre-SUV past. Point out the human signal in the climate, if you can. And no models, please. Programmed speculation isn’t science. The one human emitted CO2 molecule out of every 34 that the planet normally emits can not be shown to have any measurable effect — unlike scary scenarios, which have the measurable effect of increasing government grants. I say this in all sincerity: wise up. CAGW is driven by money, not by science. The map DOES reflect reality in Philadelphia. But of course it varies from week to week. The new cap and trade is going to cost 7,700 dollars per household. It is another source of tax revenue we desparately need. The thinking is taxing in the utlilty bill, at the gas pump and inside the grocery bill is more secure than a payroll tax. You are questioning numbers and readings, but this discussion is actually a threat to pork and kickbacks. Maurice Strong and George Soros couple with Allgor and comprise the dirty carbon trinity. All I see is common flucation in the charts. The Hadcrut dataset does not contain data from the arctic region. Since the arctic is the fastest warming region on the planet, the Hadcrut index tends to understate the rising temp trend. As we see from the big red spot on the map, leaving out millions of square km can throw off a global average. re “Do you have a specific null hypothesis in mind?”. 1) Average temperature rate of rise since the last ice age will continue. 2) Average temperature rate of rise, over all data since 1850, will continue. 3) Pacific Decadal Oscillations superimposed on the average temperature trend will continue. Check out Don Easterbrook’s AGU paper on potential global cooling He projects Pacific Decadal Oscillations (PDO) dominating temperature trends through 2100. The recurring climate cycles clearly show that natural climatic warming and cooling have occurred many times, long before increases in anthropogenic atmospheric CO2 levels. The Medieval Warm Period and Little Ice Age are well known examples of such climate changes, but in addition, at least 23 periods of climatic warming and cooling have occurred in the past 500 years. Each period of warming or cooling lasted about 25-30 years (average 27 years). Two cycles of global warming and two of global cooling have occurred during the past century, and the global cooling that has occurred since 1998 is exactly in phase with the long term pattern. Global cooling occurred from 1880 to ~1915; global warming occurred from ~1915 to ~1945; global cooling occurred from ~1945-1977;, global warming occurred from 1977 to 1998; and global cooling has occurred since 1998. All of these global climate changes show exceptionally good correlation with solar variation since the Little Ice Age 400 years ago. The IPCC predicted global warming of 0.6° C (1° F) by 2011 and 1.2° C (2° F) by 2038, whereas Easterbrook (2001) predicted the beginning of global cooling by 2007 (± 3-5 yrs) and cooling of about 0.3-0.5° C until ~2035. The predicted cooling seems to have already begun. Recent measurements of global temperatures suggest a gradual cooling trend since 1998 and 2007-2008 was a year of sharp global cooling. The cooling trend will likely continue as the sun enters a cycle of lower irradiance and the Pacific Ocean changed from its warm mode to its cool mode. . . . The announcement by NASA that the Pacific Decadal Oscillation (PDO) had shifted to its cool phase is right on schedule as predicted by past climate and PDO changes (Easterbrook, 2001, 2006, 2007) and coincides with recent solar variations. The PDO typically lasts 25-30 years, virtually assuring several decades of global cooling. The IPCC predictions of global temperatures 1° F warmer by 2011, 2° F warmer by 2038, and 10° F by 2100 stand little chance of being correct. “Global warming” (i.e., the warming since 1977) is over! . . . The good news is that global warming (i.e., the 1977-1998 warming) is over and atmospheric CO2 is not a vital issue. The bad news is that cold conditions kill more people than warm conditions, so we are in for bigger problems than we might have experienced if global warming had continued. Mortality data from 1979-2002 death certificate records show twice as many deaths directly from extreme cold than for deaths from extreme heat, 8 times as many deaths as those from floods, and 30 times as many as from hurricanes. The number of deaths indirectly related to cold is many times worse. The challenge to AGW is to show significant variations CAUSED BY anthropogenic effects that are significantly different from Easterbrook etc. Global Warming Models have not included the PDO and other natural cycles. Consequently, they cannot differentiate between natural weather “noise” and anthropogenic causes. The performance of the models at local scale at 55 stations worldwide (in addition to the 8 stations used in Koutsoyiannis et al., 2008) is poor regarding all statistical indicators at the seasonal, annual and climatic time scales. In most cases the observed variability metrics (standard deviation and Hurst coefficient) are underestimated. i.e. the contiguous USA, is even worse. 4°C) and predict a rise more intense than reality during the later 20th century. (e.g. maximum and minimum monthly temperature) is worse. strongly negative, while correlations vary from negative to slightly positive. Could models, which consistently err by several degrees in the 20th century, be trusted for their future predictions of decadal trends that are much lower than this error? See further details in their numerous publications. . . .We used the U.K. Met Office Hadley Centre’s annual average thermometer data from 1850 through 2007 to examine the performance of the benchmark method. The accuracy of forecasts from the benchmark is such that even perfect forecasts would be unlikely to help policymakers. For example, mean absolute errors for 20- and 50-year horizons were 0.18°C and 0.24°C. . . . Again using the IPCC warming rate for our demonstration, we projected the rate successively over a period analogous to that envisaged in their scenario of exponential CO2 growth—the years 1851 to 1975. The errors from the projections were more than seven times greater than the errors from the benchmark method. Relative errors were larger for longer forecast horizons. Our validation exercise illustrates the importance of determining whether it is possible to obtain forecasts that are more useful than those from a simple benchmark before making expensive policy decisions. . . .
We look forward to anyone providing counter studies that include these effects and still provide statistically clear evidence for anthropogenic global warming. Guys, it’s pointless to look at month to month temperature data, or even year to year, and then argue about whether anthro GH gases are responsible or not. GHG increases only affect the underlying long-term temperature trend. With feedbacks, this only amounts to a little over 0.02 degC per year on average. The range of natural variability is +/- 0.4C from the average, 40 times the contribution of GHGs, and global temperature can move from the top to the bottom of that range in a year. This means we have to wait DECADES to really see if there has been a change. You have it exactly backwards. It is an “actual” temperature method that is sensitive such things and the anomaly method that removes this sensitivity. Anomalies are much better behaved than absolute temperatures. For example, they are correlated over long distances, whereas surface temperatures can vary greatly. (As an extreme example, compare the temperature at the top of Mt. Washington in New Hampshire to the temperature in a nearby valley.) See here http://data.giss.nasa.gov/gistemp/ and here http://data.giss.nasa.gov/gistemp/abs_temp.html for further discussion. Climate alarmists always attempt to claim that natural events are caused by humans. But they can not provide testable evidence to support their conjectures. Arctic ice naturally fluctuates on multi-decadal cycles. What we are seeing now has happened many times in the pre-SUV past. I’m not so sure LT will persist this El Nino compared to 1998. Also, the oceans were still warming prior to and after 1998. Since 2003 the oceans have been losing heat, or certainly not gaining any. Joe Bastardi thinks surface temps will come crashing down by winter IIRC. He’s got a pretty darn good track record. The HadCrut Arctic hole is about the same size as the RSS Arctic hole, so your theory doesn’t work. Se the second figure for reference. Bastardi’s prediction about the global temperature and the end of El Nino is a no-brainer, not the pronouncement of The Oracle. If you run correlations on the data, it becomes very clear that the El Nino is the biggest driver of short term (months to 2-3 years) global temperature changes. El Ninos always end, and when they do, the globe always cools. In general, surface temps seem to lag satellite temps during ENSO years. With GISS just reporting the warmest April on record, I expect HadCRUT to be high this month as well. In addition to the links that I have given above, here is a place with more links to the various statements from various scientific societies: http://en.wikipedia.org/wiki/Scientific_consensus_on_climate_change You have a strange definition of “bland” and “stay[ing] out of the fight”. It makes very little difference if the WFT offset or normalise is used. The results turn out almost identical. 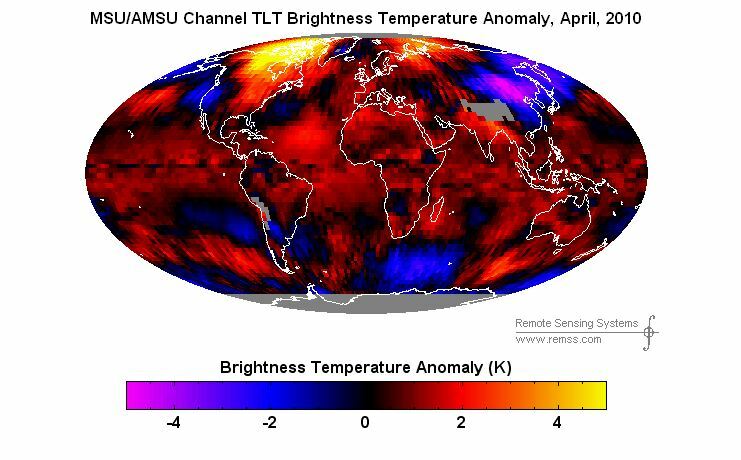 and let’s not forget that the oceans can hold vastly more heat than the atmosphere, and no satellite can measure the variation in ocean temperature below the surface. If you follow the numerical data of these temperature trend plots, you find that they are often revised, presumably due to error corrections, reinterpretations of data, or who knows what. If 1998 data was revised, there must be some reason for it. Wren is obviously not a geologist. (1) It is well know, and widely published, that year-to-year surface temperature anomalies are magnified with height, This is due to moist convective transport of heat from the surface to the atmosphere by evaporation and precipitation; It’s been seen in radiosonde data before there were ever satellites. (2) It is similarly well known that this heat transport takes some time to occur, especially on large space scales (e.g. the tropics) with a 2 month or so average time lag between peak surface temperatures and peak tropospheric temperatures in the case of El Nino/La Nina. The magnified warming with height is the same effect as the so-called “hot spot” that is expected with *long-term* warming, but which the satellite data do not seem to support so far. Some think this is a big deal, others not so much, and still others think is an artifact of errors in one or more of the measurement systems. According to my number crunching, that long term slow cycle in global temperature correlates best with the AMO (Atlantic Multidecadal Oscillation). When temperatures were rising from 1920 to 1940, so was the AMO. When temperatures were wandering aimlessly (more or less flat) from the late 1940s to 1974, the AMO was either flat or falling. From 1974 to 2000, the AMO was rising in concert with global temperatures. Since 2000 the AMO appears to be in a flat trend (hard to tell because it bounces up and down a bit in the short term), and eyeballometrically so does global temperature (although statistically, global temp is still consistent with a slowly rising 0.2C/decade trend since 1974 – this month the Hadcrut index is right on the centerline of that trend plot). This does not mean that the AMO alone drove the warming from 1974 to 2000, but it does seem to have added to that warming and given a boost above the warming attributable to GHGs. The statistics over 160 years show that CO2 is the highest single correlating factor to global temperature, with an R-squared of 63% (vs Hadcrut). In a multi-variable correlation derived from 16 variables CO2 “explains” 47% of the fit. It “explains” the really long term trend but cannot explain decadal, multidecadal and short term variation, nor should we expect it to. I think that is not well understood. ENSO is related to a change in air and water currents in the tropical Pacific which leads to anomalous warming in the eastern Pacific, but it also affects temperatures farther away. Hypothetically less vertical mixing in the ocean could cause higher than normal surface temperatures, thus raising global temps. I saw a paper recently that claimed that there is a reduction in clouds in the tropical Pacific during ENSO which then allows more sunlight into the ocean. I was thinking about HadCrut vs. NCDC and GISS indicies (not the RSS), which do various things to eliminate this Arctic hole. However, although in theory the HadCrut index should have lower numbers because of the Arctic omission, in reality it doesn’t seem to be there in Tamino’s graphs. In http://tamino.wordpress.com/2008/01/24/giss-ncdc-hadcru/, Tamino compares the HadCrut, GISS, and NCDC indicies. After normalizing the curves to put them on the same scale, HadCrut’s 1998 El Nino temperature spike stands out like a sore thumb over the other two’s data. It’s about 0.1C higher. Perhaps there was something wrong with the way they arrived at the numbers and they just corrected it. ??? The Russian Academy of Sciences? Fossil fuels are the only thing that Russia has going for it right now, and with the death grip that Putin has on that country, I wouldn’t believe anything that came out of Russia. I agree that Dr. Roy Spencer will respond to this real soon. I hear he just stepped out for a smoke and will be right back! This year will be exceptionally interesting. Especially next winther. But noone will care about cause and effect….? Too difficult, maybe? And in September…what will the arctic look like? In the middle between 2006 and 2009 maybe? That wold be nice for us humans stuck on this planet. But it wouldnt be nice for the Doomsday prophets. Al Gore would hate that. I didn’t present an argument, so there is no logic to fault. I was responding to a post upthread, not your top post. By invoking “CAGW types”, the ‘conclusion’ section of your post was about climate. I took it that the point of your examination of ENSO event disparities was your prediction on how people with certain ideas on climate will change their selection of data sets. Otherwise, what was the point you were trying to make? Having followed this thread, I think you were halfway prescient – it is plain that some of the denizens at this site are quick to abandon a long-favoured data set (UAH, because it has a cooler long-term trend and is produced by a climate change skeptic) when it doesn’t accord with their preferences (short-term). We’ll see what the other half do. I doubt you’ll witness quite the flip-floppery from that section, but who knows? It is anomalous. That’s what the mainstreamers say, too. It is well-known by anyone who’s done a bit of reading on surface v satellite temps, that ENSO fluctuations are more pronounced in the satellite record, and that there is often a lag between them. The ENSO deviations are interesting, but in terms of climate, what matters is the long-term trends. For the purposes of comparing satellite to surface, we now have 31+ years of data, and we find that the trends are converging, which is to be expected if the different methodologies are reasonably robust, and as a result of increasing amounts of data. That only works for temps, since 1979, of course, but the similarity of trends lends credence to them all. For times earlier in the instrumental record, there are three well-known data sets to average, or you could throw in the Japanese and Russian global temp records for good measure. Seems to me that picking out noticeable differences in short-term weather phenomena, when the long-term trends are very similar, amounts to splitting hairs – when commenting on climate. Will someone here – yourself for instance – suggest a reasonable data set to work with, or various to average, that can be worked with (without being sarcastic)? Or is the focus here is too narrow to countenance that kind of progression? At what point do we stop haggling over molehills and check the view from the top of the mountain? Yep – you could be right. I’ve no idea what it’s trying to do. A bug in the algorithm seems a possibility. Are you sure I was right. I’ve just done this plot …. i.e. 2 plots of Hadcrut; one with offset=-0.23 and the other with the normalise option. The plots are identical – unless I’m going mad. I always liked the the satellite soundings over surface temps as it was a better indication of the lower to mid trop than the surface date, which theoretically only measured the lower 6 feet of the trop. El Nino of course traverses several thousand feet of the tropesphere. Warm sea surface temps pulse and exhaust warm tropical waters poleward throughout the tropesphere. This is not always evident in the surface record. The record tropespheric temps (record since 1979) could also be a reflection of accumulated atmospheric warming these last several years -especially in the tropics and subtropics. If the ENSO model is correct, corresponding Kelvin Waves should upwell cooler sea surface temps. The CFS models are predicting a near normalization in global temps for 2011-2012 (ie much closer to the 30 year mean). This means that somewhere tropespheric temps will drop significantly. I would imagine this would be in the tropical tropesphere as well as the NH. Huh, learned something from Wikipedia today. The wrens are passerine birds in the mainly New World family Troglodytidae. There are about 80 species of true wrens in about 20 genera. The genus eponymous of the family is Troglodytes. Only one species of Troglodytes occurs in the Old World, where in Anglophone regions it is commonly known simply as the "wren" as it is the originator of the name; it is called the Winter Wren in North America. The name wren has been applied to other, unrelated birds in Australia and New Zealand. They wrens are mainly small and inconspicuous, except for their loud and often complex songs. These birds have short wings and they cannot see at night. Several species often hold their tails upright and sleep on the ground. Wrens are insectivorous, eating insects and spiders but they will also eat fish, small rodents and lizards. The family name Troglodytidae is derived from troglodyte, which means "cave-dweller", and the wrens get their scientific name from the tendency of some species to forage in dark crevices. They can’t see at night, don’t know where they are going, so they’re known for foraging in dark places? Interesting. Between the winter and the current cool temps here in central Pennsylvania, we don’t have many insects outside and not that many songbirds. Which is just fine with me. Not to be cruel, but the same loud unchanging song(s), blending together into raucous noise, gets annoying after awhile, especially when I’m trying to concentrate on serious thought. At least the turkeys provide some variety. Too many wrens, not enough cats. Where’s that intrepid cat Kilowatt when you need him? Normalization should not alter the scale, at least it does not do that in any image processing function I have ever used. In such image processing, I would normalize to a common background level in order to cancel out atmospheric transparency variances, and thereby eliminate, upon median combine, the noise source of the atmosphere to get at faint signals from deep space. If you should come across a normalization function that also alters scale, it’s not pure normalization. The family name Troglodytidae is derived from troglodyte, which means “cave-dweller”, and the wrens get their scientific name from the tendency of some species to forage in dark crevices. I’m a little unclear on the posting protocols – I was banned for a while for not posting under my full name. But insults and ad hom (from posters who likewise don’t post their full names) are admitted? I believe what you say about the “It is well know, and widely published, that year-to-year surface temperature anomalies are magnified with height”. But how do you actually derive the Surface Temperature, which is at such odds with the reality that we have just experienced in the Northern Hemisphere. 2 plots of Hadcrut; one with offset=-0.23 and the other with the normalise option. The plots are identical – unless I’m going mad. Have you tried emailing the author @woodfortrees.org (his name with that domain works) to ask for clarification? I did recently and got a reply within a few days. Are you trying to suggest that either of the 2 temperatures that you have quoted are NOT VALID in some way”. The point is not to COMPARE them (Meerkats do that), it is to use them in AVERAGE calculations. Thanks to Dr. Spencer for the explanations above. So the question becomes: those claiming 2010 to be the warmest year on record – are they correct? Please provide a link that verifies this. Sounds unlikely to me. Please provide a link to the bases of your numbers. You’re jotting down lots of temperatures, percentages, etc., on this thread and providing no documentation. What does that mean? It is at odds with the anecdotal reports that you have heard? That is why data is better than anecdotes. In much of the middle and southern part of the U.S., they did experience colder than normal temperatures this winter, but places in Canada were above normal. Here in Rochester (which is sort of in-between), we had about an average winter followed by a March and April that were in the top few warmest on record. In the real world, we cannot take temperature measurements at every place on the earth’s surface and so it is good to actually average a quantity that has properties that make it more amenable to averaging, particularly under circumstances of limited data. My (and Hansen’s) point is that the variable “surface temperature” does not have such properties. Temperatures are often very different even for stations quite close together. Hence, letting one particular place represent the temperature for a region can lead to large errors depending on the measurement location that you choose. However, temperature anomalies show a significant positive correlation even out to distances of about 1000 km. Hence, if one uses temperature anomalies, one is able to get good results for an average with much fewer, widely-spaced measurement locations than one can with temperature. I’m not sure why this concept should be that difficult to grasp, although it does appear to be, at least for some. The Earth is ON FIRE! How cheap is RED inkjet when bought with other peoples´money! They like RED…….and Kool aid, of course! Depends on how you’re defining Arctic. If you define the Arctic as being North of the Arctic Circle, there are weather stations North of the 66N included in HADCrut. There are also sea surface temperatures North of the Arctic Circle included in HADCrut. Refer to link above and the one that follows. The RSS “Arctic hole” is much smaller. I tweaked the contour levels in the plots to show coverage. That’s why the reds are so intense. Please provide a link that verifies this. Where does the heat come from during an El Nino? It is mainly just a cyclical +/- exchange of ocean heat with the atmosphere versus what normally happens. Sometimes the equatorial Pacific ocean is putting a little more sun-derived heat into the atmosphere (El Nino); sometimes it is putting a little less heat into the atmosphere versus normal (La Nina). Let’s look at a map of the Out-going Long-Wave Radiation in the 3 months that the 1997-98 El Nino was pumping most of its heat into the Earth system. Sea Surface Temperatures were 2.8C above normal (or about 33C) but the OLR was down by 60 watts/m2 versus normal. Tropical convection storms hold the heat in the atmosphere and do not let it escape into space as readily as it would. The SST’s at the surface were putting out 500 watts/m2 (or 33.0C) but only 440 watts/m2 (or 23.0 C) was escaping into space in the normal manner. This moderately-sized important region was pumping out 10.0C of extra heat into the areas west of the ENSO regions (and the prevailing winds over 3 months meant it extended across the entire tropics) and some of the other heat was pushed directly north toward the pole (and the prevailing winds meant it ended up in north-west North America and the Arctic). These are the stardard areas impacted by an El Nino or a La Nina (the wide-tropics and northern North America). The storm tracks change slightly so that California gets more storms in an El Nino and Oregon/British Columbia get more during a La Nina. The Indian Ocean heats up, the equatorial/mid-latitude Atlantic Ocean heats up during an El Nino. Just 1 or 2 degrees C impact in these areas is noticeable. 50 and 60 watts/m2 of extra heat held in is a very big number. Doubled Co2 is only supposed to be result in 3.7 watts. Personally, I’d rather look at anomaly data. Scale of variations and time lags. Global TLT anomalies lag NINO3.4 SST anomalies and their variation is much less. Thank you for your sincerity, Smokey. I asked you what null hypothesis you had in mind, and you replied the “theory of natural climate variability.” Unfortunately, to be a valid your null hypothesis needs a corresponding hypothesis, but there isn’t one, so your null, as stated, is a nonstarter. #1 Hypothesis: All global warming is anthropogenic. Null: Some global warming is not anthropogenic. #2 Hypothesis: Some global warming is anthropogenic. Null: No global warming is anthropogenic. Climate scientists aren’t trying to falsify Null #1 and Null #2 is falsified by the fact CO2 from man’s activities adds to the greenhouse effect, and this effect is a know warming influence. If anthropogenic CO2 recycled as fast as “that the planet normally emits” you might have a point. However, it doesn’t as evidenced by the fact CO2 levels in the atmosphere continue to rise, and a growing proportion of that CO2 is from man. That’s the human signal. Over and over, I hear that the earth has warmed before man could have been a cause. The implication is if nature can cause global warming, man can’t, which is an obvious logical fallacy. The fact is anthropogenic warming plus natural warming could result in a world far warmer than the climate in which modern civilization has been developed, with serious consequences to our descendants. During the 1997-8 El Nino? 1. The near equatorial zone loses heat mainly via decompression. That it has warmed appreciably is shown by the rapid advance of temperature at 850hPa over the period of record, an advance almost three times that at the surface. 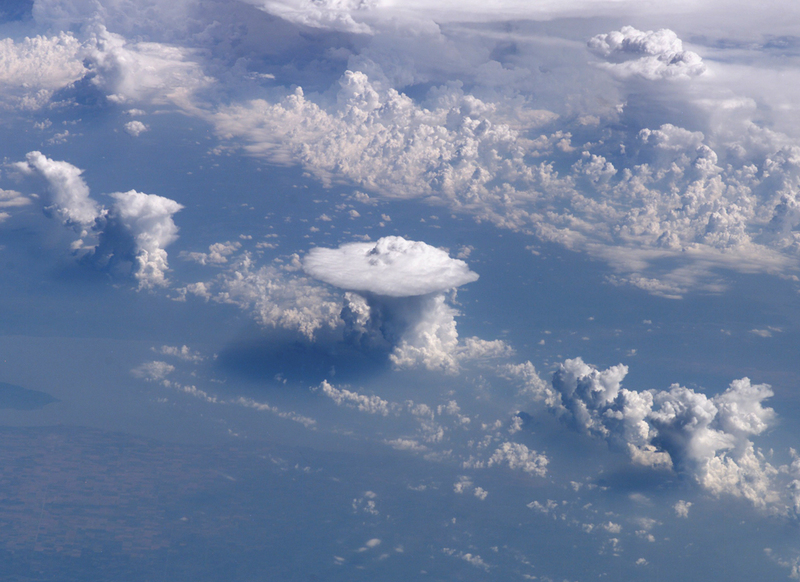 The greatest convection is seen over land in the tropical rain forests of the Congo and the Amazon. Convection is driven by release of latent heat in turn driven by evaporation from plant stomata. Long wave radiation from this zone has diminished as the surface has warmed showing the importance of decompression as a cooling mechanism. 2. The sea surface in the near equatorial zone has warmed very little. The atmosphere here is close to saturation with respect to water vapor most of the time. Rain tends to fall each afternoon but it is a fact that this occurs much more intensively near land than in open ocean areas. The ocean tends to store energy from sunlight because sea surface temperature is a long way short of the boiling point of water. 3. What goes up must come down. It is in the subtropical high pressure zones located over the oceans that the atmosphere heats via compression. This leads to a loss of cloud cover over an expanded area of the ocean. But the ocean, unlike the near equatorial zone is cooler, is not heat saturated, does not respond with an immediate increase in evaporation and therefore has the capacity to store the extra energy that is gained via the expanded zone of cloud free sky. 4. As the ocean stores energy it is entirely natural that long wave radiation from the Earth should diminish. After all, more energy is going into storage in the ocean. So, we have the paradox of diminished outgoing long wave radiation during El Nino events. 5. La Nina events are characterized by increased long wave radiation from the Earth as the atmosphere vents the moisture that it has picked up via increased evaporation during El Nino events. The atmosphere stores energy in the form of water vapor. As the temperature of the atmosphere increases its capacity for energy storage also increases. The ocean stores much more energy than the atmosphere. Its energy storage performance is mediated by cloud cover which controls the level of energy incident at the surface and wind speed which affects the rate of evaporation and mixing of surface waters with waters at depth. Sunlight penetrates to a depth of up to 300 metres in clear water. It is in this near surface zone that the variation in energy storage mainly occurs. Long wave radiation from the Earth has increased over the period of measurement. This reflects increased precipitation. Australian rainfall has been increasing for 100 years. The only way a body like the Earth can emit more long wave radiation over time, see increased precipitation over time and experience surface warming is for energy intake to increase. Energy intake is mediated by cloud cover over the oceans. And the issue is: Which is the chicken and which is the egg? Is it the increase in surface temperature that is responsible for the much greater increase in atmospheric temperature at 14000 Ft (3000 metres). You note that temperature peaks at 14,000 metres after the increase in surface temperature so it seems that the atmosphere is responding to change in surface temperature and it could well be via the release of latent heat of condensation. But there is an even greater increase in atmospheric temperature at 7000 to 10,000 metres that is coincident with the increase in surface temperature. Is the consequent reduction in ice cloud density responsible for increased surface temperature due to higher levels of incident radiation. And where does this heating occur? Hm-mm-m. Who to believe, you? Or Dr Spencer? There really is no CAGW “hypothesis.” It is simply a conjecture; an opinion, based on always-inaccurate computer models. To elevate CAGW to the status of a hypothesis, you will need to provide testable, reproducible, empirical evidence quantifying the effect of human CO2 emissions on the planet’s temperature. And a good hypothesis makes accurate predictions. Sorry about your CAGW models, which can’t predict their way out of a paper bag. So far, all attempts to provide empirical, testable evidence have failed so badly that the proponents of CAGW no longer even make the attempt. Instead, they resort to endless appeals to authority, ad hominem attacks, and the stale old chestnut of “consensus” — a non-scientific argument if there ever was one. But you, my little chickadee Wren, can be in the history books by providing testable evidence showing the specific fraction of a degree warming per teragram of anthropogenic CO2 emitted. Simple, no? But if you can’t provide such testable, reproducible measurements, then you are back at the conjecture stage, demanding $trillions based upon your …opinion. but I’m sure similar results should be obtainable with any other global temperature index. The CO2 data was taken from a combination of the Mauna Loa atmospheric CO2 data and the Law Dome ice core data to extend the data back to the beginning of the HadCrut time series. Is there any way to post images? But you don’t even need to go back 160 years. Even from the start of the Mauna Loa dataset in 1958 without the Law Dome extension, the R-sq is 69%. From 1979 to present, the R-sq is 57%. Then the shorter and shorter a time span you use, the smaller and smaller the R-sq becomes, because the small year to year variability due to CO2 gets lost in the large year to year “natural causes” variability, like El Nino. However, using a long time period is preferred because it reduces the chance that the correlation is just a coincidence due to CO2 and temp rising at the same time since 1974. Spenser theorizes fewer clouds cause global warming, If this means the warming trend of the past century was caused by a trend to fewer clouds, I am puzzled. I haven’t noticed that its be getting less and less cloudy where I live over the years. I’m also puzzled by you presenting a null hypothesis for hypothesis you believe doesn’t exist. You can’t have one without the other. The following is an simplified example of a hypothesis and it’s null. Hypothesis: Burning fossil fuels has a warming influence on global temperature. Null hypothesis: Burning fossil fuels has no warming influence on global temperature. Evidence supporting the hypothesis: Burning fossil fuels releases CO2 into the atmosphere, and CO2 is a green house gas that helps keep the earth warm through the green house effect. The null is rejected on the basis of the evidence. Is that a testable hypothesis? Not in a simple statistical way, as it would be, if for example, my hypothesis was I could taste the difference in Pepsi and Coke at a 95% confidence level in a 20-trial double-blind test, and then was able to reject the null(couldn’t taste a difference) by correctly identify the sodas enough times. However, some hypotheses don’t readily lend themselves to this kind of testing, but do have sufficient supporting evidence to be accepted. The reason I asked about the correlation is that I would have expected it to be higher. I’ve correlated CO2 and monthly global temperature in the past and found the monthly data to have a higher correlation coefficient than what you’ve listed. And as illustrated above, the correlation is a function of CO2 Concentration’s dependence on sea surface temperature, not the other way around. Evidence supporting the hypothesis: Burning fossil fuels releases CO2 into the atmosphere, and CO2 is a green house gas that helps keep the earth warm through the green house effect. Is that a testable hypothesis? Read the work by VS and Tim Curtin which show now correlation either on the Global or Local scale. But of course you STILL won’t beleive it, will you? In much of the middle and southern part of the U.S., they did experience colder than normal temperatures this winter, but places in Canada were above normal. Being an American, you seem to think the Northern Hemisphere is the US Continent, you seem to have forgotten the whole of Europe, Russia, China and India, all of which had record breaking Cold weather. Yes but anomalies to what? The whole dataset or a selected time span? So you are saying that the less datapoints that you use the more Accurate the results? Reasonably Strong does not cut it in Statistcs. The “misrepresenting chart” to which he refers is not the scatterplot above, but a short-term (1995-2009) comparison plot by a “Senator Fielding” with the CO2 scale exaggerated WELL beyond its actual relationship with temperature. Incidentally if you do a scatterplot of the annual average data instead of monthly data, the R-sq goes up to 77%, but really only because the monthly short term variability is taken out. In your May 16 2:07 AM you link to a comparison of CO2 rate of change with various temperature data, including Nino 3.4 SST anomalies. I’m not familiar with the Nino 3.4 data series(es). Doesn’t it represent the temperature DIFFERENCE between eastern and western areas of the tropical Pacific and not the actual sea surface temperature? I have not searched the exact cause of the seasonal variability in CO2, but obviously it is associated with the time of year. The forcing impact of Co2 is logarithmic with respect to its level and then the resulting Forcing itself is also logarithmic with respect to its impact on temperature. A linear function works okay right now because we are in a particular section of the function that is something close to linear, but it starts to move off for CO2 levels lower and higher than the range used. I was using the North American continent as an example of some people looking very selectively. What is your evidence that “the whole of Europe, Russia, China and India, all of which had record breaking Cold weather” and why is it that neither the surface temperature record nor the satellite record seems to support your claim for the Northern hemisphere as a whole? The baseline period for the anomalies essentially just represents a constant offset. Why does it matter what you choose for that baseline? And, no I am not saying that fewer data points give more accurate results. What I am saying is that, given the limitations on the amount of data that you have, using the data in an intelligent way can give more accurate results than using it in a less intelligent way. Why don’t you read the original paper then? Arguing that a one-sentence summary of a scientific paper does not have enough detail is a pretty lame claim. But the notion that [man’s emissions of greenhouse gases are a significant effect on the climate] remains an unproven and untestable hypothesis, and therefore it is not “science.” There is no proof whatsoever that [these emissions have a significant effect. AGW] is a mere theory–and a questionable, constantly-changing one at that. Ultimately, if accepted at all, it must be taken by sheer faith. Okay, I admit that I had to get a little creative regarding the part in brackets. The actual quote can be found here: http://www.gty.org/Resources/Articles/A176_How-Important-Is-Genesis-13 The fact that these sorts of arguments can be made against science that I think most of us agree is good science shows how weak such arguments are, particularly when they contradict the conclusions that just about all of the major scientific academies and scientific societies have reached. The issue is that in a multiple linear regression of global temperature and climate variables, CO2 is the most dominant factor. Then there is the fact that CO2 does absorb infrared, giving it a compelling physical reason to be correlated with temperature. Maybe a model can be constructed without it, but you’re not supposed to throw out data, not even one point, without a darn good reason, let alone the biggest model factor. A lot of strange ideas in here now. The derivative of SST almost equals -SOI (minus volcanoes) i.e El Nino heats the global ocean and SST is the integral of -SOI. I’d have to agree w/John Finn on this. The spatial coverage of urbanized areas is very small, certainly less than 1% of the globe. However, for very densely urbanized regional areas like much of Europe, eastern China, Indonesia, the US megalopolis from DC to Boston, etc., the UHI effect might be picked up by satellites when the air is rising from these areas. But the total effect globally would be quite small, I’d think. The linked plot is not updated to the present. Right now global temp is right on the centerline. Every process has natural variability. This kind of method called “control charting” is used to monitor that variability. It’s mainly only when the width or value of the range changes that you know for certain that something has changed in your “process”. The uptrend is about 0.2 deg C/decade. Not all of this is attributable to CO2, by my regression only about 0.13/decade is. So my point was, year to year temp varies over a 0.8C window, thanks to natural variation. As long as the “process” doesn’t change, it should stay that way. In fact, it is pretty consistent even if you go back in time to 1850. The temperature range is typically about that much above and below the moving-average trendline even way back then. However, the yearly change in the trend line is only one 40th of that range, or +0.02C per year. It takes 20 years for the centerline to move half of that range. So you can’t possibly tell if the trend is changing direction from one month or one year of data. Even if the rising temperature trend comes to a dead stop, there is so much intra-year and year to year variation that you won’t even be able to see it for 5-10 years at a minimum. Just look what happened in the recent past for proof of this. Take 1992 for an example. Temperature dropped really low that year and it looks on this plot like it was curtains for global warming. (Of course, this was probably Pinatubo related but…) Then over the next 5 years, instead of GW ending, it shot up to its 1998 record high. But did it keep going up? No, it moved back down to the trendline and in winter 2007/8 it got smacked down to the bottom of the range again due to a brisk La Nina. Did it keep going down in 2008 and 2009? No, it rebounded back up to the trendline again where it is today. It’s doing what it normally does, bouncing around A LOT. As long as global temperature is bouncing around inside this rising trend range, around the centerline, the rising trend is still “intact”. To really be sure the trend has changed, the data should start breaking out above or below the “control limits” for a sustained period of time (i.e. not just briefly like it did in hot 1998 and cold 2007/8 winter). Recent data however still has temperature bouncing around that centerline, THEREFORE THE RISING TEMPERATURE TREND IS STILL INTACT. It may look to our eyeballs like the trend has flattened out since 2000, but it has done things like this before since the trend began in 1974 AND RECOVERED to keep on rising. There is SO MUCH short term variation in this data, that it is not statistically possible to falsify the null hypothesis that “global temperatures are rising at 0.2C per decade”. That will take AT LEAST another 5 to 10 years of data. If the trend rate changes only a little bit, say from 0.2C per decade to 0.1C/decade, it may take even longer than 10 years to declare that warming has officially slowed. I watch the monthly temp and ice coverage data just like a lot of you guys probably do. (I check the quarterly new case rates in the global war on polio, too. And Spaceweather.com for NEO close encounters and the sunspot of the day.) It’s like a sport, if a tediously slow one, and you cheer for your own team when it goes your way and get a little glum when it doesn’t. BUT you have to remember that you can’t rest assured that you’ve “won or lost” based on just one month or year of data. P.S. : Is there a different way than CAPS to show emphasis? I don’t mean to shout, I just want to provide some inflection. I doubt Bart, VS, or Curtain claim rising atmospheric CO2 levels don’t have a warming effect on global temperature. If any of them do, please quote them. Can you flip that transparency so the writing is not mirror image? Or at least reproduce the legend so the lines make sense to those trying to read the graph. And yes some of us do look at the references. As usual, Joel Shore’s psychological projection causes him to assign his own faults onto others. The True Believers in catastrophic AGW, like Joel Shore, base their belief in approaching thermogeddon on blind faith, simply because they must: faith is all they’ve got, because CAGW is not supported by any testable evidence, or by validated models capable of making accurate predictions, or by the planet itself. It is simply a conjecture. When Joel says “most of us agree,” he must be talking about him and the mouse in his pocket. Because his constant appeals to authority are all he’s got; testable facts supporting CAGW are non-existent, and consensus is an illogical argument, only employed because there is no empirical evidence showing that humans can control the climate. But you play the cards you were dealt, and CAGW is a fact-free conjecture. Time to fold. “So I think I get it. You forgot to mention that as the warm air goes up (think Cumulonimbus ) the vapor condenses to rain and puts all that heat that got sucked up from the ocean into the atmosphere closer to escaping to outer space. Somehow the emphasis is always on the heat minor percentage of heat radiated back down from that piddling little .03% CO2 and not on the heat rapidly transported up by thunderhead formation. And yes I know you were being sarcastic. 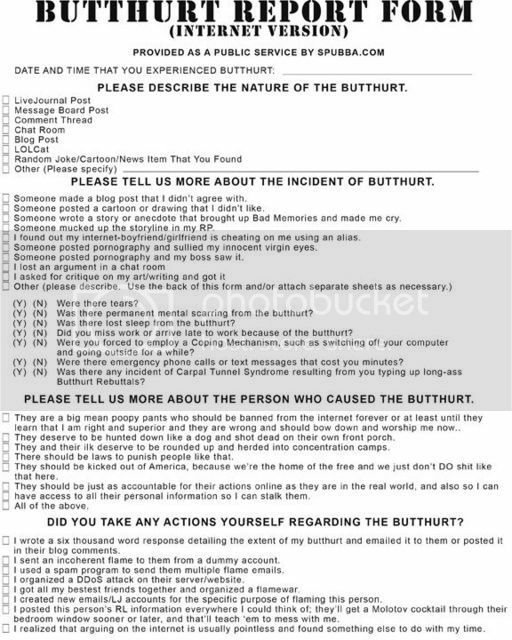 Wren, I pointed you to the truth, if you are too lazy to read it foryourself I am not going to do it for you. Both VS & Curtin (NOT Curtain) don’t claim, they PROVE no correlation. May 16, 2010 at 5:45 amWhat is your evidence that “the whole of Europe, Russia, China and India, all of which had record breaking Cold weather” and why is it that neither the surface temperature record nor the satellite record seems to support your claim for the Northern hemisphere as a whole? Exactly my point, as humans we experinced the cold, it was Headline news, we have our own thermometers to take measurements with to confirm, seasonal records broken in the US, Europe, Russia, Mongolia, China. So just why is the Official Temperature Set and the Satellite temps so at odds with REALITY. The problem: The planet’s surface is 70% ocean and only the top few millimeters of the oceans absorb Downward Longwave (infrared) Radiation . So the impact of any additional DLR due to anthropogenic greenhouse gases will be released as evaporation. The NINO3.4 region is located in the central equatorial Pacific, coordinates 5S-5N, 170W-120W. NINO3.4 SST anomalies are one of the primary measures of the sea surface temperature component of ENSO. It is the basis for the NOAA ONI Index, which is a 3-month running-average of NINO3.4 SST anomalies. What does spatial coverage have to do with anything? It’s the magnitude of the warming, unrelated to “area”. Considering a “well mixed” atsmosphere, does a 1 km\2 erupting volcano or a 1 km\2 coal plant put out the same thermal energy as a 1 km\2 parking lot? That’s debatable, but beside the point anyway. The issue is causality not correlation. You brought up Bart, VS, and Curtin. If they think their analyses proves CO2 from man’s activities does not have a warming affect on global climate, I presume they say it, and will not mind you quoting them here. So please let me know. Thanks, Bill Illis. Pasting that to the reference book. Does the S-B law apply if wavelengths are blocked? I thought that adding a GHG to the atmosphere blocked a part of the IR spectrum and then the temperature has to increase in order to make up for the radiation that was blocked, but the actual amount of radiation emitted from top of atmosphere doesn’t necessarily increase. Right, Wren. The Bart post doesn’t talk at all about the cause of warming. It is entirely focused on refuting the claim that GW has stopped in the last 10 years. Unless the info that AC Osborn is referring to is in one of the two-thousand one-hundred and fifty-seven comments to that post. Anyone care to read through them? Not I.
Ow! How far do you have to go to have a comment blocked on this site?! Was something I said non-factual? I just have a thing about being compared to a creationist. Completely unprovoked, too: I never made one comment about Joel Shore in this entire thread. He just made his drive-by comment personal, for no apparent reason. It would have been just as effective if he’d used the generic “skeptics”, with his usual inappropriate quotation marks. And yet the ocean temperature indicies show increases similar to land temps although smaller, do they not? or is it the SST in a region that includes both a piece of zone 3 and a piece of zone 4? Well if you say Joel started it, I’ll take you at your word. Not going back to look for it. But seriously. What gets a comment censored here? Was I supposed to read something when I registered? Does anybody read that stuff? OK. I went back and skimmed thru early VS comments. Half of what he says sounds to me like made-up jargon/ gibberish, including applying an “econometric” model to this problem. As for “proving” that there’s no correlation between CO2 and temp, VS seems to be saying that insolation is identified as the single largest factor in temperature. I don’t doubt that prior to 1850 this was true, particularly if you go back hundreds of thousands or millions of years, since there was no significant sustained amount of GHGs being artificially injected into the system to perturb it and CO2 was a “slave” to other drivers (and a positive feedback). [Note – Look up Paleocene-Eocene Thermal Maximum (PETM) for a “natural experiment” of injecting very large amounts of GHGs into the atmosphere.] I’m not aware that anybody denies orbital forcing and the Milankovitch theory’s general principles. In fact even some AGW scientists state that the sun is the main driver of temperature UP UNTIL the last 3o years, during which they state that temp breaks away from its insolation correlation and gets driven more by GHGs. How can anyone claim that this is not a correlation? If VS is claiming that this statistical method is not valid and you MUST use his stock market method to show what’s really going on, this is fatally flawed method-cherry-picking. To deny that there is a correlation in the above link is an “extraordinary claim”. To claim that the CO2/temp relationship is “random” in the face of this evidence does not make sense for the time period in question. To argue that regression analysis is invalid in THIS case is an “extraordinary claim”, and “extraordinary claims require extraordinary proof”! So where is the extraordinary proof that this regression is wrong or that we can’t use regression as a methodology or that it LOOKS like a correlation but really isn’t??? I did not see it in VS’s comments, other than his emphatic assertions and saying “look in this link”. I saved you the trouble, helpful rascal that I am. It’s @May 16, 2010 at 5:47 am. Check out the link in the comment. There is a wide range of opposing viewpoints here, and WUWT doesn’t censor like RC, climate progress, etc. The results of WUWT’s no-censorship policy are obvious. See here and here. Alarmist blogs prefer to follow up the rear, rather than allow free, uncensored discussion on their blogs. That’s why they’re losing traffic. That, and of course the fact that CAGW is bogus. Finally, since you asked, the site policy is under “Policy” on the masthead. Or, to put it in a way that Smokey might be better able to comprehend because it is more ideologically palatable to him: Say, you and I had different professions that complemented each other and you paid me $1000 every Monday for my services and I paid you $1000 every Friday for your services. Now, let’s say that the government comes in and starts taxing me $50 per week. Over the course of the year, I watch my bank account dwindle and I blame the government. However, by Smokey logic, the government is not to blame for this. After all, it is responsible for only 1 in 21 of the dollars that gets removed from my bank account. Clearly, you are to blame even though you and I have had this exchange going for 30 years and during that time, my bank account has remained remarkably (although not unsurprisingly) steady. Ideology has nothing to do with it. You simply lack empirical evidence of CAGW. My advice: quit trying to make up those fantastic scenarios. Take an aspirin and lie down. Better yet, have a slice of chocolate cake with a scoop of ice cream, it will take that silly argument out of you. Sugar and fat will always calm you down and make you sleepy. The appeal is to the facts. 1. Burning fossil fuels releases CO2, a greenhouse gas, into the atmosphere. 2. Greenhouse gases are a warming influence on global temperature. 3. As more fossil fuels are burned, the level of greenhouse gases rise. 4. Higher levels of greenhouse gases drive global temperatures to higher levels, despite temporary pauses as a result of natural cooling influences. The facts explain why you won’t find a scientific society of standing that disputes anthropogenic global warming. That’s because Land Surface Temperatures mimic and exaggerate Sea Surface Temperatures, not vice versa. I get a little tired of these graphs suggesting that the sensitivities of the instruments involved are sufficient to quote temperatures to hundredths of a degree. Fact is that the satellite measurements have a sensitivity of 0.3Celsius so these readings should really only be shown as steps with 6 possible steps in the whole graph. What they have done is taken multiple readings and then quoted them to two decimal places (again) as if the original measurement was that accurate (which it never was and never needed to be – because it was only for weather purposes, not climate). Without that process, it would be entirely impossible to detect any trend at all, and that is before you get into the issue of the actual accuracy of the measurement. “The appeal is to the facts. So if we don’t understand how the sun works, we don’t understand how the clouds work, we barely understand how the oceans work and volcanic activity is a complete wild card, what makes you so sure that the slight increase in the trace amount of CO2 in the atmosphere is primarily responsible for the slight increase in Earth’s average temperature that seems to have occurred over the last century? I don’t know of many people who dispute the existence of anthropogenic global warming. Most people who travel between cities and the burbs are familiar with the Urban Heat Island Effect, and the basic science of CO2s slight and logarithmic upward influence on Earth temperature seems reasonably well founded. However, I think there are many intelligent people who see through the Catastrophic Anthropogenic Global Warming Narrative and the flimsy predictive models that it’s based on. Individuals who claim to have figured out how to accurately predict and even control Earth’s temperature 50 – 100 years into the future are guilty of hubris, are you one of them? Webster’s defines hubris as “exaggerated pride or self-confidence.” If I were James Hansen I would be proud of how my “most likely” 1988-202o global temperature scenario I made 22 years ago has predicted the current temperature. On the other hand , if I had predicted no more warming, I wouldn’t be proud. But who would predict no more warming when global temperatures have been rising for a long time you might ask. The answer is anyone who thinks we should do nothing about man-made global warming because we don’t know the future with absolute certainty. Implicit in that view is a prediction of no more warming or none that matters. “Webster’s defines hubris as “exaggerated pride or self-confidence.” If I were James Hansen I would be proud of how my “most likely” 1988-202o global temperature scenario I made 22 years ago has predicted the current temperature. The weekly NOAA ENSO update has a surprisingly rapid development toward La Nina conditions. The equatorial upper ocean heat content chart is in the -0.7C range (sorry chart doesn’t translate over very well). And the animation is showing cool upper ocean conditions unlike anything I’ve seen before. The latest SST map is also showing major changes toward La Nina. I have many shortcomings, but I do try to refrain from berating others for their shortcomings. I’m afraid you misinterpreted my comment on James Hansen. I didn’t mean to imply his pride is exaggerated. But he does have much to be proud about when it comes to climate modeling and projecting. The American Meteorological Society awarded him their highest honor in 2009, the Carl-Gustaf Rossby Research Medal, for his contributions in climate modeling, understanding of climate forcing and sensitivity, and for clear communication of climate science in the public arena. The link you provided refers to what someone said Hansen said he predicted, rather than to what he presented in a paper or report. I don’t know if Hansen ever confirmed the accuracy of the comments attributed to him, but I do know people may misreport or embellish what others say. “I have many shortcomings, but I do try to refrain from berating others for their shortcomings. My response was two sentences long and my tone could best be described as sarcastic, or maybe indifferent. Hansen was so wrong that his supporters had to attempt to rewrite history and you fell for the deception. Read it for your self! Two others commented on Jantar’s question but they didn’t mention what I thought they might. So I am commenting here about a concern I have. (See Satellite Temperature Measurement.) The process of constructing a temperature record from a radiance record is difficult. One widely reported satellite temperature record, developed by Roy Spencer and John Christy at the University of Alabama in Huntsville (UAH), is currently version 5.2 which corrects previous errors in their analysis for orbital drift and other factors. The record comes from a succession of different satellites and problems with inter-calibration between the satellites are important, especially NOAA-9, which accounts for most of the difference between the RSS and UAH analyses . NOAA-11 played a significant role in a 2005 study by Mears et al. identifying an error in the diurnal correction that leads to the 40% jump in Spencer and Christy’s trend from version 5.1 to 5.2. But I asked myself, “If they over-adjusted will the warmers correct it? Will they complain? Evidently they didn’t, because since that correction (FORTY FREAKING PERCENT????!!!) UAH has been reading higher, not to mention the re-adjustments to the earlier data. My gut (which isn’t worth anything in any technical investigation) tells me they DID adjust wrong. It tells me that they got to Christy and Spencer enough that those two haven’t complained since then. I totally respect Christ and Spencer, but something tells me they got bludgeoned until they submitted, and since then they’ve somehow been too intimidated to squawk. UAH went from reading low to reading high. When it was low, there was screaming. When it was high no one has uttered a peep. One of my recurring doubts comes in when someone says that A causes B, in this case ENSO causes heat. When we see A and B and they appear to move in tandem, assuming one is the cause and other the effect should be done only tentatively and it should be presented as only tentative. There is heat and there is ENSO. I have always thought of ENSO as a resultant, an effect – not a cause. It is a transporter of heat, YES. But is it the SOURCE of the heat? The speculation that there might be mixing or lack of mixing of the deeper ocean heat to the surface is only speculation. There are a lot of comments on this post that indicate belief in the reality of this mixing. But there isn’t much solid anything behind the speculation. It is just grabbing at straws because nothing better comes to mind. One comment talked about it “coming from above.” If it came from above, why would it be localized in the western Pacific along the equator? Along the equator, yes – but why THERE? In some ways, the closest thing we have to ENSO is the Gulf Stream. The Gulf Stream is not the cause of the heat within it. It gets its heat from the Gulf of Mexico. The heat comes from the slow meandering the current does clockwise around from its entry into the gulf north of the Yucatan, and then around the coast of Mexico, finally exiting through the Florida Strait. The water stays baking in the Gulf long enough to absorb huge amounts of heat. My question is this, “Is there any kind of baking possible in the western equatorial Pacific region? Is there a possible slow circulation there, too? But then, even if such a phenomenon occurring, why does it flow eastward then and only then – when the area has reached some massive heat accumulation? This question must arise whether the heat comes from below or above. There certainly appears to be a connection between the accumulation of the heat and the subsequent reversal of the equatorial water current. But appearances are not us looking at causes, but us looking at effects. Some talk about this all in terms of the air currents blowing the water eastward. But large atmospheric events are also talked about as ONLY arising from the heating of the land or water. So these ideas SEEM to be getting it backward. Air heating generally, if not always, comes from the surface being warmed by radiation and then heat convecting (mostly) upward. Land rarely gets heated by the air over it, but by the Sun. So, where is the heat accumulating? And why does this tie in with the change of the currents? Are they both caused by some single other phenomenon? If so, what? Mixing: Thermoclines. How deep is the thermocline in the equatorial western Pacific region? A generic ocean temperature graph is shown at Thermocline, where below 200m the temp has dropped by 16C. This article also states that the tropical ocean has a relatively stable thermocline. The variable thermocline in temperate zones is tied in with summer and winter variability of solar energy. If the graph is reasonably correct, what warmth is available from below to upwell and mix? None – it is substantially cooler below. If mixing occurs, then it is upwelling/mixing during La Niña and failing to mix during El Niño. Could the heat be stored in the vertical region between the thermocline and the surface? In 200 meters? But the temps are declining with depth, so again, if anything is going on, it would appear that it is NOT coming from below, except from possible cooling thought the mixing during La Niña phase. But is there enough heat stored in that 200 meters at times when there is NO mixing? Can it sit there and “soak” (in a heating sense) long enough to create the long heat plume that identifies an El Niño? And if it can, WHY does it happen THERE? And in such a narrow band? And why does it then motor eastward? Where does the motive force come from? The winds? The same ones that don’t push the water in that direction at other times? What changes the wind current direction? Does all this have a single cause? Or is it a slow confluence of factors, kind of like a resonance that wows and then backs off, and then wows again in an oscillating temporal way? Or like two or more non-equal oscillations (or maybe two more or less equal ones that are out of phase) that are of long enough pitch that they add together for several months in their positive phase and also in their negative phase, but they get very equivocal in between? Perhaps each oscillation has its variations which complicate and confuse matters. But these oscillations are just speculation. Is there any chance they really exist? And if so, what are they? Oscillations in the local thermocline in that location? Oscillations in the boundaries of warm currents bypassing each other? This latter might explain why the heat tongue/plume heads east – the boundary shift allows the eastward-heading current to push through, where in the other phase it is blocked by a north or south current. And does the PDO have ANY part in the creation of the El Niño or La Niña? Doesn’t the PDO also imply some contention between currents, sometimes reversing or blocking a warm or cooling current? And could the PDO have daughter currents or fractal-like eddies (like the ones on the boundaries of the Gulf Stream off the Eatern US) that grow and shrink at smaller time scales? All this is speculating, and not judging others’ ideas, just throwing my impressions into the fray. If anyone cares to, jump on all this and rip it to shreds. Or build on any of the ideas. They are probably too simplistic, but might trigger something in someone’s head. The technical details of each scenario are not in the Congressional testimony but rather in the scientific paper http://pubs.giss.nasa.gov/docs/1988/1988_Hansen_etal.pdf (see, especially, Appendix B), which in fact tell a more complex story. For example, Scenario A assumed no major volcanic eruptions whereas Scenarios B and C assumed a major volcanic eruption (and indeed Mt. Pinatubo did erupt). Also, the assumptions for the growth of the emissions are more complex: For example, Scenario B assumes CO2 emissions GROWTH reduces from 1.5% at the time to 1% in 1990, then to 0.5% in 2000, and then finally to 0% growth in 2010. I also think the methane and CFC forcings turned out to be lower than assumed in Scenario B. The correct way to separate out the climate predictions from the assumptions in the emissions scenarios is to compute the total GHG and natural forcings in each scenario and compare them to the actual forcings that occurred. 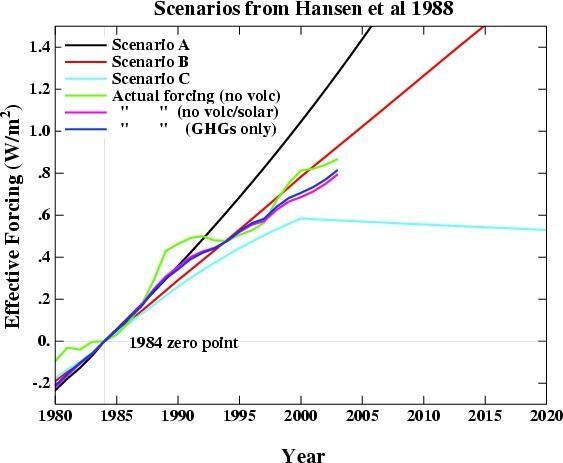 When this is done ( http://www.realclimate.org/index.php/archives/2007/05/hansens-1988-projections/ ), it is seen that the forcings more-or-less tracked Scenario B, if not a bit below that scenario ( http://www.realclimate.org/images/Hansen88_forc.jpg ). Perhaps Dr’s Christy and Spencer would like to show us a comparison of temperatures since 1998, version 5.1 vs version 5.2. I’d be very keen to see such information along with the surface record. – – So instead of explaining WHY it is OK to normalize 1 set of Data & not the Other, you said that. … the 1998 Peak is identical in Both, though in the “Neither”, uah temps are generally lower EXCEPT in 1998.